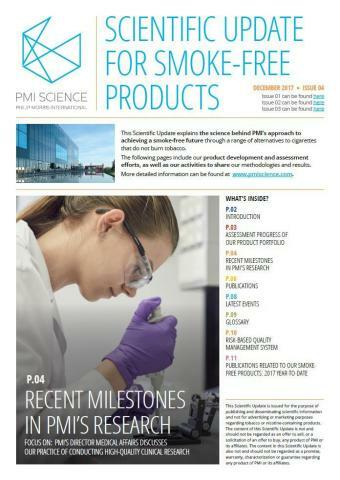 LAUSANNE, Switzerland--(BUSINESS WIRE)--Dec. 12, 2017-- Philip Morris International Inc. (PMI) (NYSE/Euronext Paris: PM) today released its latest Scientific Update for Smoke-Free Products, a regular publication on its research efforts to develop and assess a range of smoke-free alternatives to cigarettes. The latest issue of the Scientific Update can be found at this link. This issue of the Scientific Update provides a closer look at some of the principles and practices on which PMI’s scientific assessment program is built. Director Medical Affairs Dr. Patrick Picavet describes specific examples from PMI’s clinical program that highlight the company’s commitment to the implementation of best practices, transparent research and the well-being of clinical trial participants. Beyond recent events and publications, this issue also describes PMI’s progress towards sharing all raw data from studies on IQOS in part through the new data-sharing platform called INTERVALS. PMI’s extensive research and assessment program is inspired by the well-recognized practices of the pharmaceutical industry and in line with the draft guidance of the U.S. FDA for Modified Risk Tobacco Product (MRTP) Applications. PMI employs over 400 world-class scientists, engineers and experts who conduct rigorous research, including laboratory and clinical studies, as well as ground-breaking systems toxicology. The assessment program also includes studies on actual product use and correct understanding of product communications, as well as post-market research. Philip Morris International Inc. (PMI) is a leading international tobacco company, with six of the world's top 15 international brands and products sold in more than 180 markets. In addition to the manufacture and sale of cigarettes, including Marlboro, the number one global cigarette brand, and other tobacco products, PMI is engaged in the development and commercialization of reduced-risk products (RRPs). RRPs is the term PMI uses to refer to products that present, are likely to present, or have the potential to present less risk of harm to smokers who switch to these products versus continued smoking. Through multidisciplinary capabilities in product development, state-of-the-art facilities, and industry-leading scientific substantiation, PMI aims to provide an RRP portfolio that meets a broad spectrum of adult smoker preferences and rigorous regulatory requirements. For more information, see our PMI and PMI Science websites.